The Fandom: unique, exciting and brilliant. “Cosplay ready, Violet and her friends are at Comic-Con. I was very lucky that the lovely Jazz over at Chicken House sent this over to me a while back and it’s sat in my TBR ever since, so when I finished a book and saw it staring at me, I knew it was time to finally pick up The Fandom. I am so very glad I did pick it up in the end! What I loved about this book was the duality of Violet carrying out the story versus the way that Rose lived out the story. The man Rose falls in love with versus the man Violet falls in love with. The characters in The Gallows Dance versus the characters that Violet and co meet. How things have so much more depth than just on the page. There’s back stories of The Gallows Dance that Violet didn’t even know about, that she discovers having been thrust into this life. Another thing I loved about this book is that you get 2 books in one. 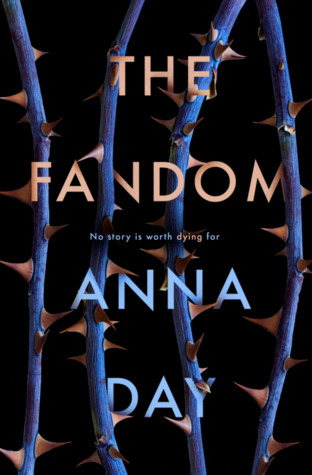 You learn the story of ‘The Gallows Dance’ through the story of ‘The Fandom’ and I have never come across that before. I absolutely loved it. Seeing the evolution of one book within another. Using Violet’s knowledge of The Gallow’s Dance to get her through The Fandom. So so clever. I loved the characters. They made the story for me. I want to marry Ash. I want Katie to be my best friend (she’s sweary and I love it). Violet is fierce and bold, without realising her own brilliance. Saskia is one of those dark, mysterious characters. Nate is just the lushest thing ever, I really loved him. The characters and their relationships with each other are pretty incredible. I met lovely author Anna at YALC this year and she’s a Geordie. This makes the book even better for me. I am the proudest Geordie you will ever meet, so for there to be this incredible book written by an incredible Geordie makes it even better! (I am not biased or ANYTHING). I hope there’s a sequel to this. I really want to see what happens next! If you had to be thrust into your favourite book, where would you end up? Are there any books you’d hate to be thrown into? Talk to me on twitter (@eenalol) or leave me a comment! I would love to find out the books you love! Great review, m’dear. I need to read this soon! I started reading it on the train back from YALC but then got distracted watching Pride & Prejudice. Ooops. I really need to pick it back up, as what I did read was excellent.